Upon its inauguration in 1901 the Overland Limited carried passengers for portion of what was billed as the "Greatest Masonic Pilgrimage Ever." The Overland Limited was one of the named passenger trains of the Atchison, Topeka and Santa Fe Railway (AT&SF). Operating as train Nos. 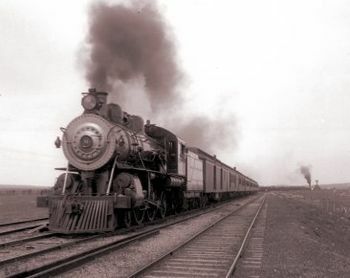 7 & 8 (sometimes known as the Overland Express) between Chicago, Illinois, and Los Angeles, California, the line was inaugurated in 1901 and ran until the Santa Fe Eight took over the route in 1915. First-class trains included a dining car, while second-class trains stopped along the way at Fred Harvey Company eating houses. A named passenger train jointly operated from the mid 1890s to July, 1962 by the Chicago and North Western Railway, the Southern Pacific Railroad, and the Union Pacific Railroad also bore the moniker Overland Limited. This page was last modified 15:25, 10 July 2014.